The multi-store model of memory is a good place to start when studying memory as it was the first widely accepted model of how memory works. It is however not the definitative explanation of memory, and different areas are expanded on in other articles. It was proposed by Atkinson and Shiffrin in 1968. The above diagram represents the model. It consists of three basic stores: sensory, short-term and long-term memory. And the process by which information is passed to each store is also shown. Information can also be lost from each point. The most important factor is that information must pass through all stages in order to get to the end. This is the first port of call for information. It gets its name from the fact that the information it recieves is sensual (visual, auditary, smell, touch). The encoding (type of information) is either iconic or echoic (see below). The capacity is said to be vast but the duration however is only 0.25 to 2 seconds. Iconic storage is for visual information, you can see the iconic storage in your sensory memory by closing your eyes, and for a very brief moment you will see an 'after image' of what you were looking at. Another store in sensory memory is echoic storage which is auditory or sound information. Information from sensory memory is passed to short term memory by attention i.e. taking notice of something. Below is a study by Sperling (1960) into sensory memory. To investigate the capacity of iconic memory. A three by four grid of numbers was flashed for 0.05 seconds. Followed by a high, medium or low pitched tone to indicate which row was to be recalled. On average, the participants were able to recall 80% of the letters on the cued row. Since the participants didn't know which row was going to be called beforehand but still managed to recall it well, you can assume that at one time all of the information was held in the sensory memory. But it decayed very rapidly. The work by Sperling is the basis of the view that sensory memory stores are large but decay very rapidly. lasting 250 to 500 milliseconds. Short term memory is much smaller than you might think, only lasting up to 30 seconds and having a capacity of 7 +/- 2 (seven plus or minus two, i.e. 5-9) items. And the encoding is mainly visual and acoustic. However, we can often hold much larger amounts of information in a process known as chunking whereby the information is consolidated into 'chunks' of information. In the example below, you will be able to remember the bottom row of acronyms but remembering exactly the same information individaully (as on the first row) is much harder. Below are the details of a study into short term memory (STM) that was conducted by Peterson and Peterson (1959). Participants were shown a trigram (three letters e.g. FGL) and asked to recall it after varying times. In between seeing the trigram and recalling it, the participant did a distraction task to prevent them from rehearsing it and moving it to long term memory. This involved counting backwards in threes. The recall reduced with time until only 10% after 18 seconds. If rehearsal is prevented then the information vanishes from STM after only a few seconds. Poor ecological validity since trigrams are an artificial thing to remember. This is a well known experiment that demonstrates the mult-store model well. In it participants are read a list of words and then have to recall them either immediately or after a distraction. The graph below shows the general trend in results found with this. This is because in immeadiate recall the first words are in the long term memory because they have been rehearsed and the last words are still in the short term memory. The words in the middle are less well recalled because you were too busy rehearsing the first to remember them well. 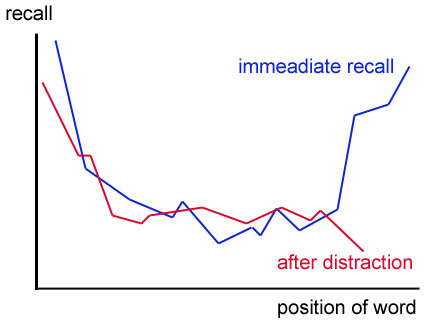 The after distraction task proves the last are remembered well because of loss from short term memory because the distraction stops rehearsal and provides a time break. So recall of the last words is poor since it has been lost from memory because it hasn't got to long term memory and is displaced from short term memory. According to this model of memory. Long term memory has a potentially limitless capacity and duration but it is very difficult if not impossible to prove this. It's encoding is semantic, that is the meaning and understanding of something.